Planning a successful fat shred can be difficult. From exercise choice to load-volume, and from muscle groups to rest times, how do you know which program will let you hit your goals in the shortest time possible? You’re here because you want to get lean, shredded and ripped. You’re here because you want to develop a physique that you can be proud of. This is your guide for achieving it. There’s no point in trying to focus on the intricate aspects of body composition without first looking at the fundamentals first. Because the fundamentals work without the advanced stuff… but the advanced stuff doesn’t work without appreciation for the important fundamentals. When you’re on a quest to get ripped you need to cover yourself from all angles. You need to think about your diet, your training and your lifestyle – that’s a lot to take in. But you can make the journey efficient and easier by using exert advice, hints and tips to iron out the common issues. So before we go any further we need to go the most important aspect of fat loss – the ‘the one true king’ of body composition if you like… calories. When you eat food you provide your body with both energy and essential nutrients. And each time you move you burn energy. Weigh these two factors against each other and you’ll either get fat loss or gain. If you eat more than you burn off each day you’ll begin to store the excess energy as triglycerides in your fat cells. They’ll swell in size and over time your pants will start to feel that little bit tighter. Before you know it you’ve developed a belly, lost all of your muscle tone and your fitness levels have disappeared. But burn off more than you take in and you’ll crack open those cells and used that stored energy to make up the difference. All-of-a-sudden those pants are feeling loose again and your abs are tight and toned. No exercise program works without an appreciation of what’s called energy balance. Key Point: All successful shredding programs take into account energy balance and calorie intake. If you were to put a whole-body workout head to head with a muscle specific program for fat loss, the split would fall into obscurity – that’s because a full-body program give you unique benefits that result in a more shredded, toned physique. Training arms on a Monday and Legs on a Wednesday just won’t cut it when you’re trying to develop a ripped and lean physique. Because circuits ramps up overall calorie burning. When you plan a workout that uses a circuit style approach (each exercise shifts from one muscle group another with little rest) you combine the benefits of strength training with those of cardio. Because you need to shift blood around your body quickly you find that your heart rate, breathing and body temperature all increase too – as well as your metabolic rate and overall calorie burn. Focusing on incorporating a few basic lifts involving as many muscle groups as possible is key. Once you’ve dusted off the cobwebs and had a couple of weeks to get back into the swing of things you’ll be looking at hitting the gym 3-4 times per week. Each workout should include 6-8 exercises that cover as many major muscle groups as possible – there’s not room for forearm curls here – it’s all about deadlifts, squats, presses and pulls. That way you can lift more weight, ramp up your strength, and really rip up those muscles until you’re dialling in at single digit body fat. Key Point: Focusing on bigger, multi-muscle exercises gives you the biggest fat burning effect. One of the key benefits of full-body training is the ability to shift between muscle groups with minimal rest. So – after a set of squats the last thing you’ll be able to do is another set of squats, because you need enough rest time to recover. But what you can do is a set of bench presses or pull-ups or ab curls because those muscles are fully rested. And as we’ve mentioned, shifting from one target muscle to the next, with minimal rest helps to ramp up the cardio effect and ultimately burn more fat. Not only will you challenge your muscles with shorter rest times – you’ll be gasping for air too! One of the simplest, most effective ways to get ripped is to increase workout density each week. This means that each time you repeat a workout you should try to do an extra rep or bump the weights you’re using by a few pounds. 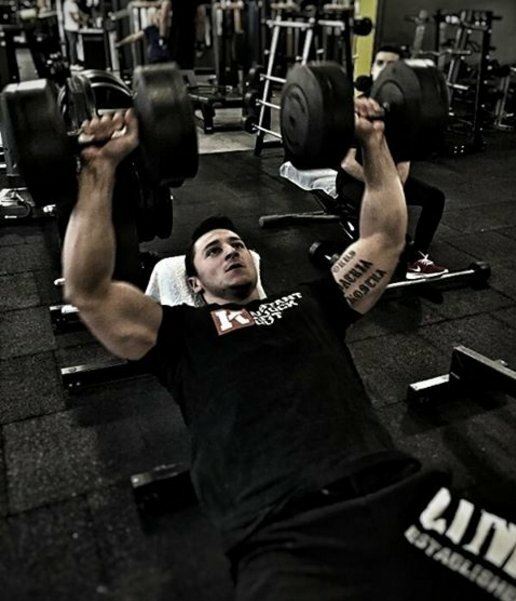 Not only does this help you progress your strength and lean mass, it also continuously sparks your body into fat loss. There’s no time to take it easy when you’re looking to get ripped, so keep pushing forward and challenging yourself! Key Point: Keep your workouts and rest times short and productive to ramp up energy expenditure. One of the quickest, most effective ways to lose fat is cardio. Bottom line. For a long time, people have been told not to do cardio because it can lead to muscle loss – but when it comes to getting ripped in the shortest time possible, cardio is definitely your friend. Minute-by-minute it burns more calories than strength training – and when you combine cardio with weight lifting you create a potent mix of muscle-preserving, fat-shredding body transformation training. What we’re looking at here is that cardio supplements your strength training and should not replace it, so don’t think you have to lace up your sneakers for a 10-mile run. Even just 20 minutes of moderate cardio at the end of workouts, or a short and intense interval session to kick things off and will work wonders for your body composition. Key Point: Supplementing strength training with cardio is a great way to boost calorie burn and get ripped. Whilst this isn’t direct workout advice as such, the psychology of fat loss is something not to be easily dismissed. When you’re trying to get ripped there’ll be days when things aren’t going well – you might be tired or you might feel like you are struggling with your diet. But don’t forget why you’re doing this and who this journey is for. Take a deep breath and think about the end goal. Set smaller targets and visualize success. And what if you do fall off the wagon? You get back on there as soon as you can. Get rid of those negative thoughts and stop feeling guilty – everyone has blips and you’ll be no different. What separates you from them though is that you’ll get back on your diet and back to the gym without hesitation. Key Point: Self-motivation is a big part of successful body transformation. You don’t just need a great program – you have to really want to achieve something too. How can I get ripped? How do you get shredded?